Siler City might not be your first thought for Holiday shopping, but you might be surprised to learn that the downtown holds numerous galleries as well as the NC Arts Incubator. In addition, new businesses are opening including The Artisan Hub Café which serves up Southern style farm to table eats as well as The Chatham Rabbit with its fresh Van Gogh coffee and The Oasis Fresh Market which aims to fulfill your pantry needs while providing an outdoor space for dining or hosting the local farmers’ market and food trucks. So don’t forget about Siler City this holiday season! The kick-off is December 6th with the “Musical Notes & Christmas Floats” Holiday parade, from 6-7 PM in downtown. 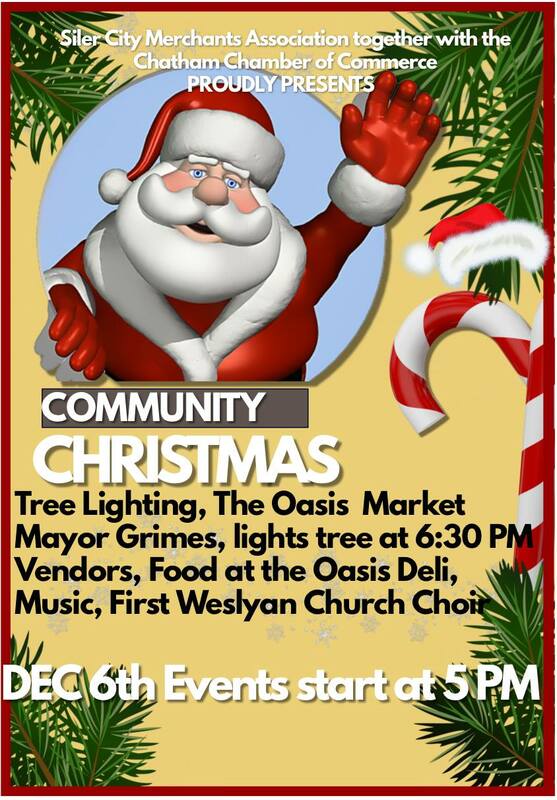 In the Courtyard on Chatham avenue you will find live music, food, vendors and SANTA!